Road Safety Minister, Jennifer Rankine is urging all South Australians to take personal responsibility for their driving behaviour during the Xmas/New Year holiday period. “Our children are our most previous cargo, so it's important to remember that every life lost on our roads is somebody's child, someone's son or daughter. “We all have a responsibility to protect each other while using the roads, either as drivers, motorcyclists, pedestrians or passengers," Ms Rankine said. Prevent Fatigue. Rest Every Two Hours. The Motor Accident Commission (MAC) is urging people setting out on long trips to ‘Prevent Fatigue, Rest Every Two Hours’. Falling asleep is the worst case scenario but fatigue can result in momentary inattention, zoning out and day-dreaming - all extremely hazardous while driving. A tired driver is a danger to themselves, their passengers and other road users. Drivers can, however, learn to recognise the warning signs and take a break before it's too late. Danger signs of fatigue include continual yawning, difficulty keeping eyes open and blurred vision. Planning your trip to include time for a 15 minute rest break every two hours. Have a light snack and something non-alcoholic to drink. Avoid driving at times when you are normally asleep. Remember, the only cure for fatigue is sleep. The reduced 100km/h speed limit is now in force on 45 rural road sections within a 100 kilometre radius of Adelaide and on Yorke Peninsula. Records show there were 290 casualty crashes recorded on 52 roads identified for a speed limit reduction in the five year period (2006-2010). These crashes resulted in 22 fatalities and 121 serious injuries. Analysis of this crash data indicates that if the speed limit on all these rural roads is reduced to 100 km/h, there’s the potential for 12 less casualty crashes each year. The State Government is continuing to negotiate with councils on the other seven local government road sections within 100 kilometres of Adelaide and on Yorke Peninsula, which have also been identified for the speed limit reduction. Remember, 100 km/h is the default speed limit on rural roads unless otherwise signed. There are many myths about driving, road safety and speeding. On 24th November, in conjunction with the Motor Accident Commission, RiAus was joined by experts from the University of New South Wales, Monash University Accident Research Centre, and the Centre for Automotive Safety Research to examine some of the myths surrounding speed on the road and explain the science of speed. This mythbusting style event stripped away shock-tactics and examined common perceptions about speed and road safety with evidence collected by world leading road safety researchers. Videos of the event are on RiAus. The Department of Planning, Transport and Infrastructure (DPTI) expanded its roadworthy inspections to include light vehicles (vehicles up to 4.5 tonne). The On-road Enforcement Team is effectively making Regency Park inspection services mobile, targeting serious vehicle defects to make the roads safer for all road users. This new team complements the work of SA Police in identifying unroadworthy vehicles and improve the safety of vehicles on SA roads. The inspection vehicle will be clearly marked with signage and roof mounted magenta coloured warning lights. Authorised officers can direct a vehicle to pull over if they suspect that the vehicle is unroadworthy, with the main focus will be on brakes, steering and suspension. We will also be looking at vehicles’ exhausts when significant smoke is evident. Drivers are required to stop when directed to do so by the DPTI inspection team. The team has the authority to issue defect notices and expiation fees where required. 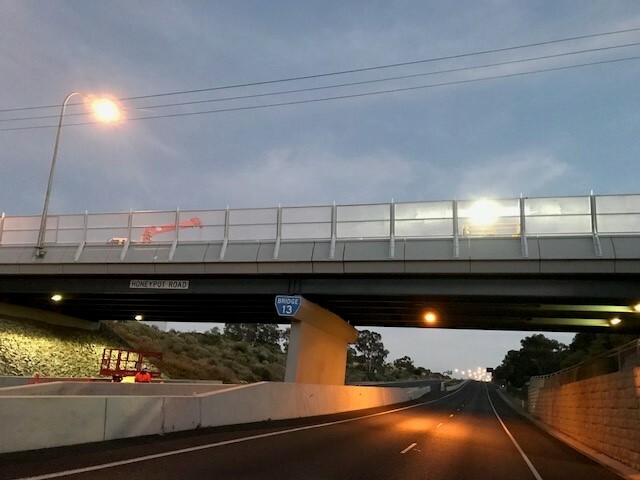 Bardavcol Pty Ltd was awarded two contracts to construct the State’s first new wide centreline treatment, along the Dukes Highway, between Tailem Bend and the South Australian/Victorian border. The contract will also include new and extended overtaking lanes and pavement works and will improve road safety along the Dukes Highway. The new wide centreline treatment which will consist of two parallel white audio tactile lines 1.2 metres apart, aims to reduce crashes caused by fatigue and driver inattention as there will be increased distance between vehicles travelling in opposite directions and additional warning to drivers that have left their travelling lane. If a vehicle begins to leave its lane, the lines will generate a vibration and buzzing sound which will alert the driver they are drifting onto the wrong side of the road. Motorists are now experiencing a safer ride through Port Augusta at the Highway One and Burgoyne Street intersection. A dedicated left turn lane from Caroona Road onto Highway One. The Department of Planning, Transport and Infrastructure (DPTI) has improved safety at the Grand Junction Road intersections at Reservoir Road and Awoonga Roads with changed traffic signalling from Friday, 9 December. To reduce the incidence of right turn crashes, filter right turns, otherwise known as “turn right with care”, will not be permitted from Grand Junction Road into Reservoir Road and Awoonga Road, except during late overnight periods when traffic is generally very low. The State Government is making further changes to improve road safety on the South Eastern Freeway descent through additional measures aimed at ensuring heavy vehicle drivers are using the right gear. Initial changes to speed and lane restrictions for heavy vehicles with five axles or more were introduced on the SE freeway between Crafers and the Tollgate in May this year. Those changes included a 60km/h speed limit for trucks with five or more axles and a restriction on them using the left lane only on the descent to the bottom of the freeway. On May 1, 2011 new laws, which include a 60 km/h speed limit for trucks with five or more axles and a restriction on them using the left lane for the start of the descent came into effect. Over a seven day period during the education period in June, the Department of Planning, Transport and Infrastructure (DPTI) conducted a traffic study at the crest near the Crafers on-ramp, 100 metres inside the start of the new 60 km/h speed zone. It found 48 per cent of heavy vehicles with five axles or more were exceeding the speed limit at that point. However, in November of this year, DPTI conducted a second traffic study at the lower section of the descent near the old Devils Elbow. This showed only six per cent of trucks with 5 or more axles were travelling more than 65 km/h. The shifting of the 60 km/h speed sign at the start of the new zone at the Crafers bridge will allow greater distance for heavy vehicles to reduce their speed before commencing the descent. Works are expected to be completed by Christmas 2011.